Venture off into the great outdoors with this 2019 Forest River Grey Wolf 22RR! 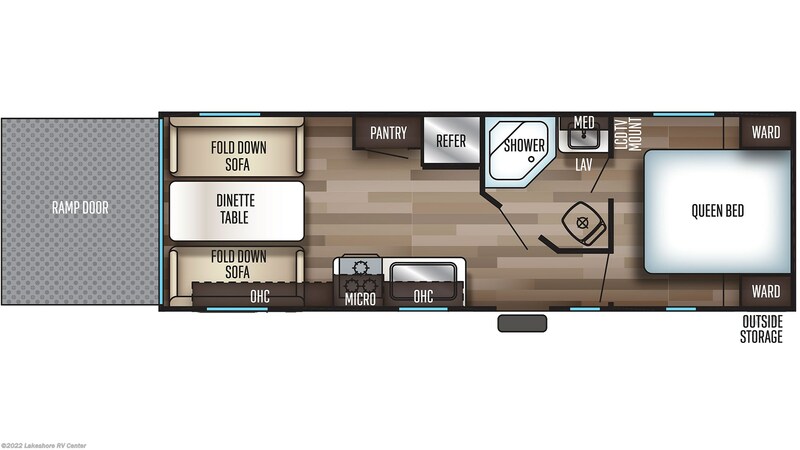 This Travel Trailer Toy Hauler is reliable and loaded with fun amenities! Lakeshore RV Center offers exceptional customer satisfaction and incredibly low prices on Toy Hauler RVs! Stop on by 4500 E Apple Ave Muskegon Michigan 49442 to find the top Michigan RV Dealer! If you have any questions, call us at 231-788-2040 to talk to an RV expert today! This RV is an easy tow on the road, with a hitch weight of 686 lbs, a ship weight of 4871 lbs, and a GVWR of 7686 lbs! When you finally do reach your destination, you can pull out the 15' 0" awning with absolute ease for added shade and protection outside! You won't miss out on a great night's sleep ever! This RV sleeps up to 4 people! For a royal night's sleep, the Queen bed in the master bedroom offers warmth and comfort after dark! andnbsp;The campground is more fun when you bring your favorite toys! They'll fit nice and easily in the easy-access 12' 9" garage! This toy hauler has an impressive cargo capacity of 2815 lbs, so even your heaviest toys can come with you on your outdoor adventures! Check out Stock # 28015 - 2019 Forest River Grey Wolf 22RR on forestriverrvsource.com!